This pleated spine book is a "Collector's Primer" on the history of inkwells. It is written out in tiny informal caps, with interesting pen and ink drawings of inkwells found during her 25 years of collecting. 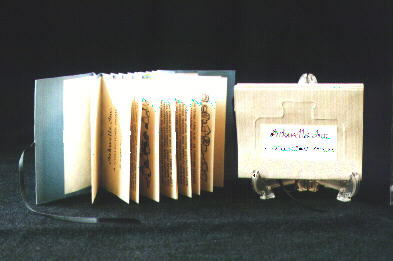 Various papers were used for bindings such as Roma, Canson Mi Tientes. The front cover is often debossed with the image on a bottle of ink, and the whole book is tied with ribbon.